Windows 10 – two weeks out! | 22 Point Blog! Large print accessibility – particularly Android. « Upgrading to Windows 10 could make future upgrades much smoother. Windows 10 – two weeks out! Ok, here is your fifteen day heads up about Windows 10! That’s right, the operating system that is quite likely to be as ubiquitous in a couple of years as Windows 7 still is today is barely a fortnight from it’s prime time debut. So, is it ready for the spotlight? And should you leap onto the bandwagon and download it on day 1? Well I’ve had some great chats with people this week about Windows 10 – you can hear my dulcet tones chatting with Byron Lee on the 7th July edition of The Talk Zone (and do check out the rest of Byron’s site and his other shows as well), and also the team at Cool Blind Tech I don’t think that one’s up yet – but you can subscribe to their podcast and they have heaps of good info as well on all things blindness, techy and cool. Coming back to the questions though my answers to those questions would have to be “It’s getting there” and “wait a couple months”. Overall, I think it’s going to be a great operating system. I think for most Windows 7 or 8 users, you should be able to get up and running with certainly less learning curve than was involved in moving from Windows 7 to 8, and there are some nifty goodies to explore which extend the functionality that you are familiar with from your current version of Windows. HOWEVER, there are still bugs, and these are unlikely to all be fixed by July 29. 1) I used my computer on Sunday night, shut down as normal, started up on Monday and started working away, and a few minutes in, the computer suddenly shut down, giving me a screen saying it was rebooting, and it proceeded to install the latest build (going from 10162 to 10166). The feedback I have got from someone who apparently works at Microsoft (not sure which area, but from one of the Windows 10 groups on Facebook) is that it shouldn’t do that and to submit that as feedback. I have done that, and I certainly hope that won’t be the behaviour of the final version, as randomly rebooting while you are working is very much not polite! It does bring up a positive point, which I believe will be included in the final version as well. 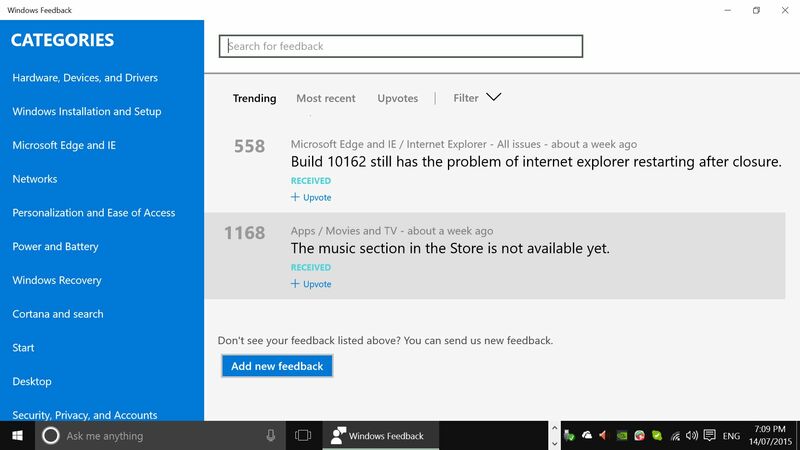 There is a feedback utility built into Windows, which lets you browse sections (Hardware, Microsoft Edge, Personalization and ease of access etc) see the feedback, issues and suggestions others have reported and also report issues yourself. 2) The other big issue I’ve found is that Jaws won’t work at all with this build (10166). For the last couple of builds, I’ve got messages before updating saying that I had to uninstall Jaws prior to it letting me upgrade as it wasn’t compatible – that’s a bit of a worry in itself as it meant that until I did that, I couldn’t get even security patches. In any case, I’ve installed it again after updating and it’s generally been ok. This time however I installed it and it just doesn’t start. When I look in the message centre I see a message saying it’s not compatible. Interestingly I do get (slightly different) constant messages saying that NVDA might not work, but so far it seems fine I have just ignored that message. Note in the two images above, the right hand quarter of the screen is what is called the Action Center. Down in the system tray is a little square speech balloon looking icon which is normally white edges and lines and clear inside. When there is a message which you haven’t read yet, it inverts to all white with black lines and you can either click on it or use the keyboard to bring it up and read your messages. As well as notifications about any issues or problems which need attention, it also contains buttons to let you jump straight to some of your settings, toggle a couple of settings and do things like take notes. Windows 10 comes with One Note which used to ship as part of Office, but I’ve never touched it before. With Windows 10, one other new feature is that OneDrive – Microsoft’s cloud storage, is now built right into Windows and you can access it directly from Windows Explorer, I’ve got my documents setup there so for the most part they save automatically right into the cloud – I’ve had a couple of issues with that, particularly some things just don’t save there so I have several copies of some things in multiple places. Anyway One Note automatically uses One Drive so that could be a handy notetaking solution, particularly as there’s an Android app which utilises it as well (there are two actually – One Note is available for both Android and Android Wear- here’s the link to regular Android version of OneNote – there’s also a OneDrive app as well as all the other office apps if you haven’t checked them out already). Where was I – yes problems I’ve found – well another one relates to that action centre – just this evening I’ve found that sometimes the action centre won’t come up no matter how much I scowl when I click on the little speech balloon – at the same time I discovered when that doesn’t work, the start menu ALSO doesn’t work. If you don’t think that’s an issue, I hope you aren’t a Microsoft developer!) – the first time it happened I restarted the computer to get it back, I’ve now found that some combination of ALT+TAB, going back to the desktop and pressing escape seems to fix it but it hasn’t happened often enough for me to be sure (it’s happened three times so far in an hour, though I’ve been on this build since yesterday morning and haven’t seen it previously so not sure why it’s started now). Finally one issue I’ve found as a low vision user, is when I do certain things in Windows Explorer which cause it to bring up a “file open” style dialogue (eg choosing “Open with” on a file and choosing “Look for another app on this PC” to find something else to open it with), the open dialogue appears quite small – my guess is that appears at 100% DPI, even though I’ve set my display properties to use 175% DPI. Other than that, NVDA seems to work pretty well, and Jaws was working ok in the last build I used it in (10159 I think). I hasten to stress again that these are bugs in the developer preview which are unlikely to still be present in the final build, at least for too long, so definitely don’t write Windows 10 off just yet. Overall where a lot of programs traditionally don’t work with newer versions of Windows than they were written for, I’ve installed numerous programs I had for Windows 7 and they work fine on Windows 10 – which is not to say that program you really love and use all the time that I didn’t try will work – as we saw with Jaws a few paragraphs ago, some programs at this stage definitely don’t currently work. One other tweak I always use which does work though is modifying the mouse cursor, I’ve used my Windows mouse cursors which you can see in the screenshots above, and they work just as well as they have previously, so I’m happy about that as they’re much easier to see than the default cursor! When will ZoomText and Window-Eyes work with Windows 10? As soon as possible after Windows 10 is released on July 29th. We’ve been testing ZoomText and Window-Eyes against the Microsoft developer releases for months and continue to pay attention to the folks in Redmond, Washington, USA. Our developers are happy with their progress thus far. What Ai Squared products already support Windows 10? We’re pleased to report that latest versions of Dolphin Guide, EasyConverter, EasyReader and Publisher are all “Windows 10 ready”. I can’t find an official statement from NV Access but as I say, it seems to work for the most part. I had a bit of trouble in a couple of places, notably getting around parts of the action centre, and the edge browser, I could access some things, but couldn’t use any of the usual internet shortcut keys with NVDA (H for headings, INSERT+F7 for links list etc). NVDA does work fine with Firefox though and that remains the recommended browser for NVDA users. Windows 10 does also include Internet Explorer which still works with NVDA. So overall, I reiterate what I’ve said all along, there is a lot to like in Windows 10, however unless you are really keen on trying out the latest software – if you’re a user who just likes to turn on the computer, do what you need to do and turn it off again and forget about it for instance – then stick with Windows 7 for another few months while they iron things out. If you’re a tinkerer and use NVDA (or Dolphin products from the look of their announcement a couple of weeks ago), you might find some things not quite polished yet, but overall, you can get around most places. If you’re a Jaws user then DEFINITELY wait until Freedom Scientific bring out their new version as from the looks of things currently you could end up in a situation where your main screen reader doesn’t work at all. If you’re a Windows 8 user who hates it, has always hated it and wants Windows 7 back (and you’re not a Jaws user) then you might prefer to take your chances with the early bugs than continue with Windows 8. If you are interested in learning more about the new features of Windows 10, definitely hit the follow button as I’m sure I’ll ramble more about it! Plus don’t forget to Subscribe to receive info from me on my upcoming book on Windows 10. Are you looking forward to Windows 10 being released? Are you going to wait or grab it as soon as you can? Let everyone know in the comments! 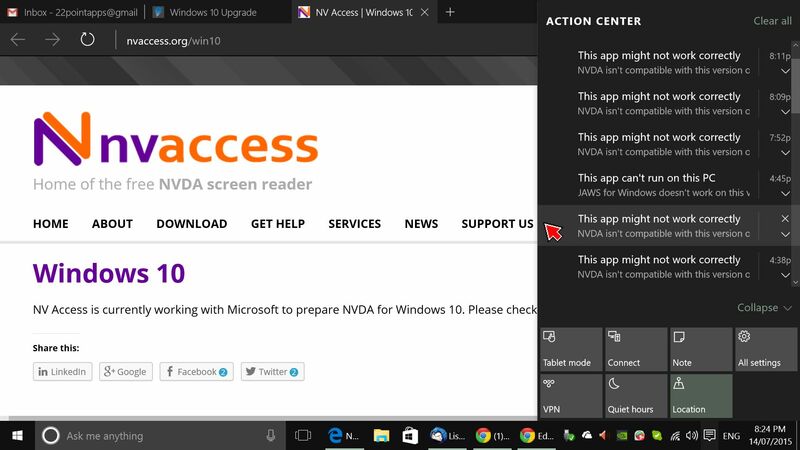 This Post was tagged accessibility, jaws, nvda, windows 10, windows insiders. Bookmark the permalink. What about Cortana for Windows 10, is it working ok? Has it been released? Good question! Yes Cortana is included BUT at this stage “Cortana is only currently available on Windows 10 for the United States, United Kingdom, China, France, Italy, Germany and Spain.” – http://www.microsoft.com/en-au/windows/windows-10-specifications – however those specifications note they are for the beta version and that could change. I did read somewhere else (I can’t put my finger on right now) that Microsoft had apparently said Cortana won’t be available in Australia at launch (I’m in Australia so was particularly interested in that) – One workaround is to set your region to say US or UK English rather than (in my case) Australian English and that seems to work at least at this stage. I’ve tried it a few times with mixed results, but then, as with any “learning” technology, the more you use it, the better it gets to know you and the more accurate it is. One thing I haven’t played extensively with yet is using it with screen reader speech running, so I’ll have more of a play and comment again, or make a new entry next week with an update. Reblogged this on GTT Program blog and resources. Could be Kevin! 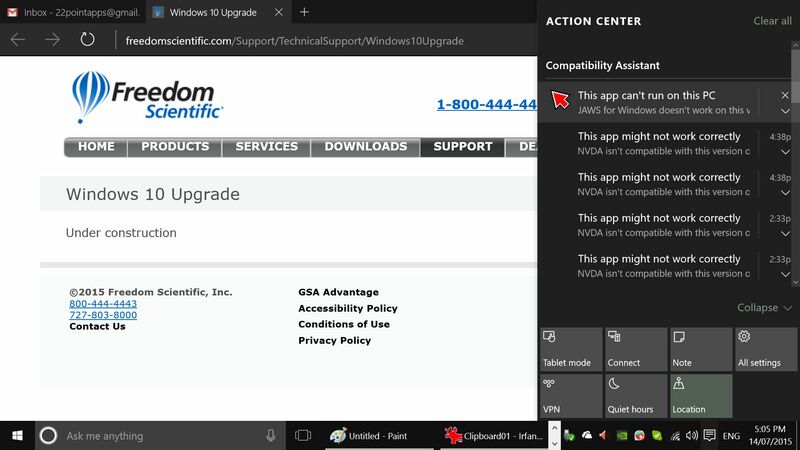 I did notice that particular issue (start menu / action center sometimes not coming up) is still present in build 101240 and still a bit random to access with NVDA, but Jaws does now work again (thanks to Al for the heads up about the new Jaws build. Microsoft Office has a new “Black” theme. Windows 10 – Three months in, how is it going? Windows 10 – 15 days in. Also big book announcement! Upgrading to Windows 10 could make future upgrades much smoother.